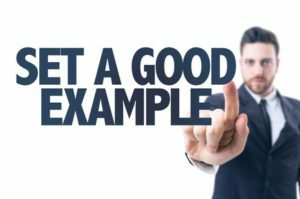 Are You Setting a Good Example for Your MSP Company Staff? Home MSP Company	Are You Setting a Good Example for Your MSP Company Staff? Whether you’re the owner or business manager of an MSP company, setting a good example for your staff is important for a motivated, trustworthy workforce. Setting a good example means living the qualities of a good leader. When you do this, your staff views you as someone to look up to, someone who inspires them and someone to emulate. The following are a few strategies you can use to develop your leadership qualities. These qualities can enhance your leadership skills, no matter how large or small your business, or your level of experience. Use them as a guide to develop into a strong leader. Communicating with your staff or team is essential for effective leadership. Conveying your ideas clearly and powerfully will inspire your team to take action on assigned tasks. Communication also cultivates relationship building between you and your team. When you have effective communication skills, you can convey them to your marketing and sales people to help them connect with your target audience, building personal relationships that lead to conversions. Communication skills are crucial for delivering important information, presentations and instructions to motivate your team. Good communication strategies build more effective problem-solving discussions with your team and create a productive workplace. Be a thinker, open to new ideas, better ways to do things and recognize new opportunities. No matter how talented you are as a leader, try not to rely on your previous knowledge but continue on a path to learning new strategies in the MSP industry. Be committed to self-development and use your insights and lessons to encourage your employees’ growth. Have the heart to feel what your employees are feeling. If you’re open and honest with them, they’ll connect with you. By putting yourself in your employees’ shoes, you can resolve tensions and disputes in a fair and understanding way. Always be ready to solve complex challenges, predict problems, strategize and prioritize your solutions. Use every resource available to you for strategic growth and transformation of your business in this technological world. Whether it’s innovative services or marketing strategies, always be ready for change. Devote your time and effort to mastering the strategies you need to add value to your MSP company. Always be willing to work hard and finish what you start. If your staff sees that you have the tenacity to do whatever it takes for success, you’ll inspire them to do the same. Have the self-discipline to use your time effectively. Try to avoid setting impractical time goals for your staff, having them stress over the urgency of the goal. Optimize your time and your staff’s time by structuring, organizing and delegating in a way that gives everyone enough time to work effectively. A great leader has a clear vision of the company’s purpose and values. With this insight, the internal efficiency of the company increases and carries down the ladder to the rest of the workforce. Your leadership influences your employees’ behavior and raises the level of their performance. When your staff performs well, whether it’s marketing, sales or customer service, then your company’s sales prospects, leads, conversions, repeat customers and cash flow increases. Great businesses are built on great leadership. Whether you’re the CEO, project manager, marketing manager or sales team leader, all the decisions you make for your MSP company are significant. The examples you set and the choices you make with character and competence shape your professional path and the success of your business.